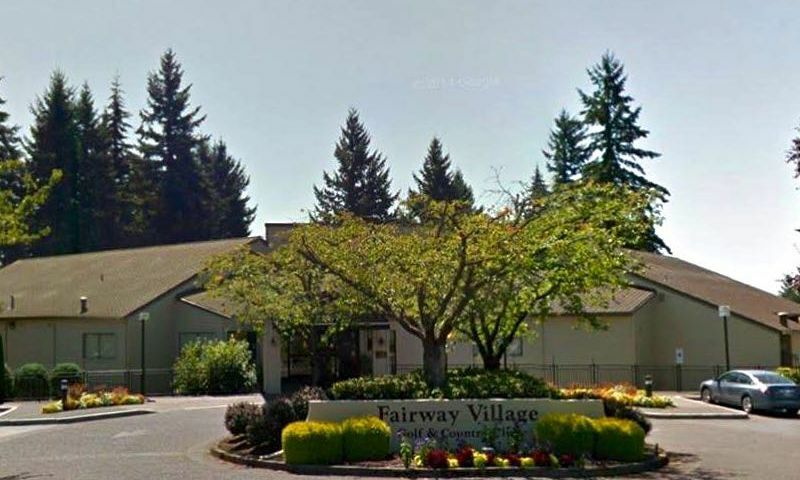 Fairway Village is a 55+ community located in Vancouver, Washington. This well-established active adult community has 824 single-family and condominium homes. Residents will especially enjoy the fact that the community was developed around a nine-hole golf course, ensuring that their next swing is never far away. Fairway Village has a well-appointed clubhouse that is perfectly equipped to keep homeowners physically and socially active. With a wide selection of floor plans that range from modest one bedroom condos to three-bedroom single-family homes, residents are sure to find a home that's right for them. Fairway Village is also conveniently located in Vancouver, Washington and enjoys close proximity to shops, restaurants, and the attractions in Portland, Oregon. At the center of the community is the clubhouse. Two exercise rooms ensure that staying in shape is easy. Fairway Village also has saunas for relaxing after an invigorating workout. There are also meeting rooms, a multi-purpose room, billiards room, hobby and game room, and ballroom for gatherings with neighbors. Spend your time joining with friends in the card room or enjoying a leisurely afternoon in the library. The terrific amenities continue outdoors with an outdoor pool, and barbecue area for enjoying the warmer months. Two bocce ball courts are perfect for some friendly competition. Scenic ponds create the perfect backdrop for an early morning jog. The 9-hole Fairway Village Golf Course weaves throughout the community and offers 2,500 yards of challenging yet accessible golf. Fairway Village was developed between 1979 and 1996 and now offers single-family and condominium units on a resale basis. Fairway Village offers 128 condominium units. These homes range in size from 700 to 1,266 square feet and have one or two bedrooms, one or two bathrooms, and garage parking. There are also 696 single-family homes within Fairway Village. These homes range in size from 1,140 to 2,358 square feet and offer one to three bedrooms, two or two-and-a-half bathrooms, and an attached two-car garage. Most homes have desirable features like golf course views, granite countertops, stainless steel appliances, and private outdoor spaces. Fairway Village provides a socially active lifestyle where neighbors become fast friends. Work out with friends with aerobics, chair yoga, walking group, or even line dancing. Play a round of billiards or join games of bingo, bridge, or hand and foot. Socialize with friends at potlucks or holiday parties. From book club to quilting to Mah Jongg, there is something for everyone at Fairway Village. Fairway Village is located in Vancouver, Washington. It is conveniently located near everyday needs, being across the street from Fred Meyer grocery store, New Seasons Market, Whole Foods, Target and restaurants. For movie night, a Regal Cinemas is within walking distance. Columbia Springs Shopping Center is around the corner and has Pier 1 Imports, Ulta, Michael's, and Ross. Fairway Village is also less than five miles from PeaceHealth Southwest Medical Center. Interstate 205 is easily accessible and the Portland International Airport is 15 minutes away. Vancouver is next door to Portland, offering residents world-class restaurants, entertainment, and museums just a stone's throw away. The surrounding area is also an outdoor recreational paradise, with Government Island, Columbia River, Blue Lake Regional Park, and the city is bordered by Forest Grove District State Forest and the Silver Star Scenic Area. History buffs will also enjoy a walk along Officer's Row, a street that has 22 preserved Victorian homes that are on the National Historic Register. Fairway Village is a terrific active adult community in Western Washington that offers terrific homes, amenities, and location. There are plenty of activities available in Fairway Village. Here is a sample of some of the clubs, activities and classes offered here. Fairway Village offers 128 condominium units. These homes range in size from 700 to 1,266 square feet and have one or two bedrooms, one or two bathrooms, and garage parking. Please Note: Floor plans are not available at this time. There are 696 single family homes within Fairway Village. These homes range in size from 1,140 to 2,358 square feet and offer one to three bedrooms, two or two-and-a-half bathrooms, and an attached two-car garage. I love it here. Taking a walk is like strolling through a garden show. Everyone is so friendly and there are so many activities that you can't do it all. 55places.com is not affiliated with the developer(s) or homeowners association of Fairway Village. The information you submit is distributed to a 55places.com Partner Agent, who is a licensed real estate agent. The information regarding Fairway Village has not been verified or approved by the developer or homeowners association. Please verify all information prior to purchasing. 55places.com is not responsible for any errors regarding the information displayed on this website.